The St. Clair River is a 40-mile long river that begins underneath the Blue Water Bridges in Port Huron, is fed by Lake Huron at its northern end and empties into Lake St. Clair at its southern end. The St. Clair River forms the eastern boundary of St. Clair County and an international boundary between the United States and Canada. The cities of Port Huron, Marysville, St. Clair, East China, Marine City, and Algonac are along its course. The St. Clair River contains the largest threatened Lake Sturgeon population in the Great Lakes; surrounds ten islands, six of which are land of the Canadian Walpole Island First Nation; forms the largest freshwater coastal delta in North America; and provides drinking water to 60% of St. Clair County’s residents. For these reasons, the health of St. Clair County’s water resources must be protected to preserve the quality of life for all people, plants and wildlife. The service area of Friends of the St. Clair River is contained within the jurisdictional boundary of St. Clair County, Michigan. It includes the St. Clair River and five subwatersheds: Black River, Pine River, Belle River, Lake Huron and Anchor Bay. Despite centuries of challenges, the St. Clair River today is well-known for commercial and sport walleye fishing, world-class scuba diving and duck hunting, boating and sailing, and international freighter watching. The River supports plant and animal species listed as threatened and endangered by both State and Federal agencies, including: the Spotted Turtle, Lake Sturgeon, 5 different mussel species, Mooneye, and Painted Trillium. The River also plays an integral role in the travel of migratory waterfowl and shorebirds. 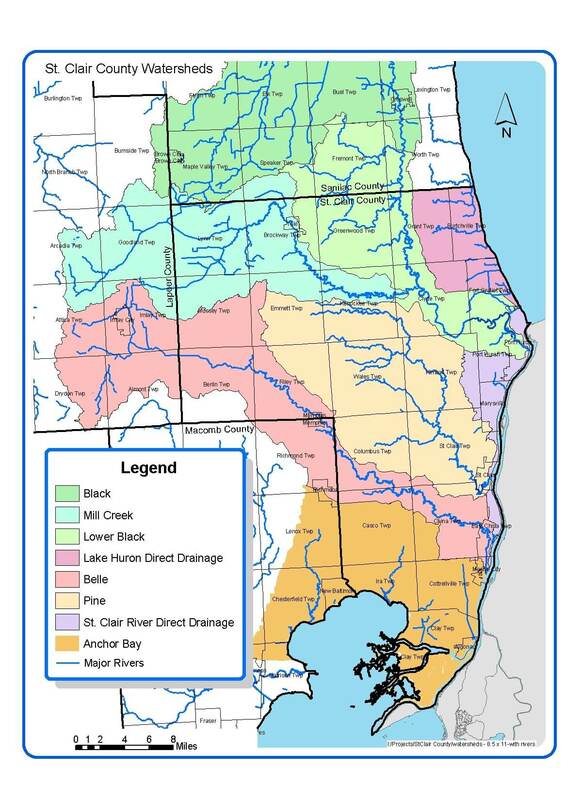 Current threats to St. Clair County’s watersheds are similar to those of other rapidly urbanizing areas including: pathogens from combined sewer overflows and wildlife waste; nutrients from agricultural and residential runoff; storm water runoff from impervious areas (i.e. parking lots, roads, driveways); toxic pollutants from industrial spills; aquatic and terrestrial invasive species; loss of wetlands and high quality habitats; and soil erosion causing sedimentation and log jams. These threats can lead to advisories for fish and drinking water consumption, closed beaches, and impaired recreational activities. For a prosperous and sustainable Blue Water Region, we recognize that it is our responsibility to bring together the private, public, and non-profit sectors to promote and protect its most significant natural features.